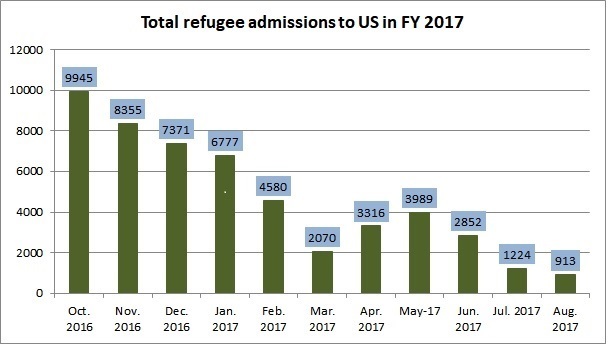 (CNSNews.com) – Nine hundred and thirteen refugees were admitted to the United States during August, the first time the monthly intake has dropped below one thousand in 15 years, and the smallest number of monthly admissions since October 2002. Even so, the shift in religious affiliation among those admitted since January 21 has been marked, when compared to the same period one year earlier. During the equivalent period one year earlier (Jan. 21-Aug. 31, 2016), however, 43.9 percent of the 56,135 refugees admitted by the Obama administration were Christians, and 46.6 percent were Muslims. The largest groups among the 51,392 include those from the DRC (8,952), Iraq (6,740), Syria (6,509), Somalia (5,953) and Burma (4,809). The Obama administration admitted 84,994 refugees in FY 2016, 69,933 in FY 2015 and 69,987 in FY 2014.